Unless you need a unique bike in limited supply (fat tire, plus, carbon fiber bike), or if you're going on a multi-day trip or participating in a special event like a triathlon and need to be assured a very specific bike will be here for that event when you arrive, a reservation is not needed. Even people who reserve bikes often switch to a different bike after they arrive. A Coastal Trail ride on a hybrid bike never requires a reservation. We have more than 200 bikes and we never run out. On rare occasions when the frame size in the price range of your choice is out, we will upgrade to a better bike but in a frame size that fits. Choosing the right bike is a collaboration. It's not uncommon to test two or three bikes before making a choice. To see photos and specs of almost all of our bikes, hover on "Rental Bikes" in the menu then choose by bike type in the drop-down menu. If you see something you might like, instead of calling, please email your choice to [email protected] along with your height and weight and we will confirm availability and provide a written confirmation. There is no deposit to reserve a bike. However if you need to cancel please let us know. When you arrive if you prefer a different bike you can switch. Also, big groups (ten or more people) should send an email so we can be prepared with additional staff and/or by pre-positioning bikes outside in front of the store. 2. Where can I park downtown? If paying to park goes against your constitution, on weekdays, you can park for free but you'll have to walk between four and six blocks. Parking is free on 4th Avenue east of Cordova Street. East of A Street the first letter of each name of the street corresponds with the sequence in the alphabet. Barrow, Cordova, Denali, Eagle, Fairbanks, Gambell, Hydra, Ingra etc. If you want to first check out our bikes before parking, or if you want to load bikes onto your vehicle and take them somewhere else, there are metered spaces in front of our store Monday through Friday between 9 a.m. and 6 p.m. It costs $25 cents for every nine minutes. There is a two hour time limit even if the meter is paid; enforcement "chalks" the tires. A citation is $20. On weekdays there is usually an available empty space however not on Friday because that's when parking spaces are reserved for tour buses that block visibility to our store and create chaos on the sidewalk. The buses stop and spaces are available again around 3 p.m.
On Saturday, on-street parking at a meter in the downtown core is free but there is a two-hour limit and available spaces are rare because the popular Weekend Market is just one block away. However if you park in front of a street meter east of A Street it is free and there is no time limit. The safest place to park your vehicle is on the north side of 4th Avenue between A and Barrow across the street from the fire station which also includes a police substation. It is only two blocks from our store. On Sunday parking in front of street meters anywhere downtown is free and there is no time limit. 3. Can I exchange the bike I rented for a different type later in the day/week? Yes. Exchange one type of bike for another type at any time. If you want to go mountain biking in the morning and road biking in the afternoon, no problem. This policy sometimes tips the balance between renting for two weeks, buying a bike in Anchorage, or bringing your own bike from home. 4. Can I bring my own pedals and shoes? For a rental of one day or less, if you bring your own pedals there is a $4 charge for the pedal swap. In other words, to take our pedals off, put your pedals on, take your pedals off, and then put our pedals back on again, we charge $1 per swap. To minimize pedal swaps that over time wear out and invariably strip the threads on our cranks, almost all of our bikes are set up with a spiky pedal that provides plenty of surface area and traction; even on the upstroke. Primo Super Tenderizer. We have a full range of clip in shoe sizes for rent. We use Shimano SPD. If renting for one day or less the cost is $4. If you rent a bike for more than one day use of our clip-in pedals and shoes is free. 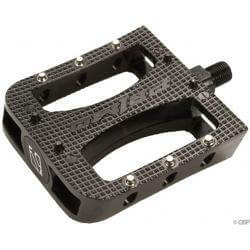 If renting for one day or less and you want to bring your own SPD shoe and clip into our SPD pedal, the cost is $2. 5. Do you sell bikes? Yes. We are Anchorage's only Authorized Fuji, SE, Breezer, and Kestrel bike dealer. We also sell Surly. Please click on their links and check-out their highly-nuanced selection. They are great bikes that sell for a great price. We sell for the lower 48 MSRP and there is no sales tax in Anchorage. If you want to buy one we may have one in stock but if we don't have the precise model, size and color you want, we will can order it so it is here when you arrive. 6. Can we store luggage, a jacket or other items we don't need on our bike ride at your store? Yes. Everyone who stores something at our store during their ride gets there own private tote. Storing things separately keeps them safe. 7. We arrive at the airport and would like to rent a bike during a long layover. How much does it cost to travel between the airport and your store? Anchorage's bus service is called the People Mover. It costs $2 each time you ride the bus. You can also buy a one day pass for $5. Every 15 minutes Route 40 travels between the airport outside of baggage claim to the downtown transit center which is located only six blocks from our store. Cab fare between the airport and downtown is about $20. 8. How long does it take to ride the 11-mile long Coastal Trail? On average it takes two and a half hours round-trip at a leisurely pace to cycle the Coastal Trail. It's 22 miles round-trip. About 1.5 hours to bike out and one hour to bike back. Riders return faster because outbound there are two hills to tackle. One is in the middle of the trail near Earthquake Park. It's not too steep but it's about one mile long. The second hill is short and steep and at the very end of the trail. People who turn around at the bottom of the second hill see almost the entire trail. If you decide to ride up the hill at the end, you have the option of returning on the Alternate Return Route. The Alternate Route adds 3 miles to the return trip. 10. Where is nearby mountain biking? At the end of the Coastal Trail is 1,500 acre Kincaid Park. Kincaid has more than 30 miles of roller-coaster trails. Here's a map. Another place to mountain bike is by taking the Chester Creek Trail past UAA to 2,600 acre Far North Bicentennial Park. Also, if you take our shuttle one way to Flattop, you can downhill on the Powerline Traill/Gasline Trail into Bicentennial Park. We call this the Hike/Bike Combo. Check out the "Mountain Biking in Anchorage" video in the menu for a cool preview of the trails. 11. How far is the beginning of the Coastal Trail from your store? 5 blocks. Right on E, left on 2nd. 12. What happens if I don't borrow a repair kit and I get a flat? Call us. Depending on where you are on the trail, we will figure out what is the most reasonable way to solve this problem. While flats are rare, they sometimes occur. 13. What happens if I have a mechanical issue that I can't or don't know how to fix with the free repair kit? Call the bike rental and we'll figure out the best way to help. 14. Who is responsible if bike gets stolen or damage, or if I get hurt or hurt someone else when riding a rental bike? Renter assumes the same risk and responsibility they have when they ride their own bike back home. Before paying, renters must sign a Bike Rental Agreement/Liability Waiver/Contract acknowledging that riding a bicycle is an inherently dangerous activity. Bike theft in Anchorage is a big concern so don't take chances and the equipment you rent won't get stolen. If you must lock up a rental bike, lock it where you can see it. If you can't see it use a U-Lock or a heavy chain lock and take the seat, repair kit, or pannier with you. If renting overnight keep the bike in your hotel room. Only careless renters get bikes and their accessories stolen. Treat what you rent the same as what you own. Renters take responsibility for the reasonable replacement value of stolen equipment. For that reason, our equipment rarely if ever gets stolen. Layers with a wind breaker or rain jacket. In summer be sure to wear or bring shorts. Even if the day starts out cool, it often gets hot (really) and so do cyclists when they ride. Sweatpants are better than pants or jeans. If you do wear pants, we will offer you a rubber band to mitigate the risk of grease stains from the chain. 16. Is there any way to get the bikes back to you without having to make the return trip? No. However, if you're concerned that you're unable to ride 20 miles round trip (skipping the last mile that is the Kincair Park hill), consider renting the bike and putting it on the front of the number 40 People Mover bus to the intersection of International Airport Road and Spenard Road. Then, ride the bike four miles into Kincaid Park where the Coastal Trail ends and return to downtown experiencing the the trail's entire 11 mile distance. On weekdays the Number 40 bus runs every 15 minutes and on weekends it runs every half hour. The bus station is at 6th and G only 5.5 blocks from the bike rental. Click Here for the Number 40 Bus Route. And Click Here for the Number 40 Outbound Schedule. It costs $2 to ride the People Mover bus.